With the Leeds LGBT+ Sport Fringe Festival launching in less than two weeks we are excited to announce over 46 events over 18 days. This festival leads up to and supports Leeds Pride. Here at the LGBT+ Sport Fringe Festival our goal is to help combat homophobia, transphobia, biphobia and any forms of prejudice or bullying of any kind. The festival is organised and run by LGBT+ individuals, groups, Organisations and their allies for the benefit of the wider community. We are a non-profit organization which sole purpose is to introduce healthy activities and improve lives, educate and respond to the needs of the LGBT+ community. On the 18th of July we have a chance to come and meet all involved in the festival and find out what is involved in their activity. This event will be held at the Cosmopolitan Hotel at 5.30pm. As long as everybody who is involved in the festival we are pleased to invite Leeds LGBT+ Hub and Yorkshire Mesmac, with a special celebrity guest appearance. Friday the 20th July kicks off the festival with the Yorkshire Terriers and Armley Leisure Centre with a 5-a-side football tournament starting at 6pm. 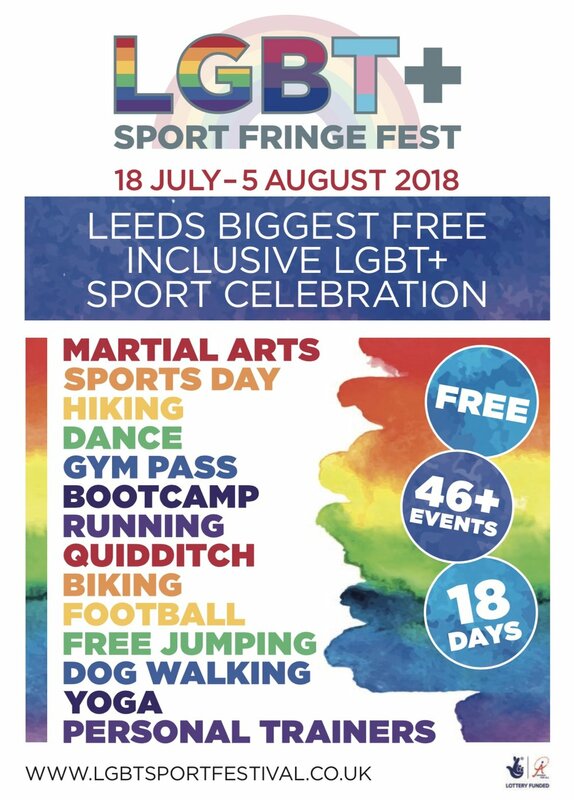 We have some great teams so come and support your favourite team, during the event we will have an obstacle course and table tennis set up, with drink promotions and food available this again will be an amazing way to kick off Leeds LGBT+ Sport Fringe Festival. At the end of the tournament trophies will be handed out to the winners and a raffle draw will be held with some amazing prizes.